We know... We love ham, too. But with some ham dinners clocking in at well over the daily recommend amount of sodium, we thought it would be refreshing to serve up some lower sodium alternatives. But hey, if ham is still on the menu, you can also cut back on sodium by using it as an ingredient in dishes like this Ham Frittata or these Scalloped Potatoes, instead of as the main course. It's a classic, and you can never go wrong with a whole roasted chicken. The recipe calls for one lemon, but we like to serve it with a few extra wedges of fresh lemon. We chose this recipe not just because it's healthy and beautiful, but it's also a great choice for anyone who doesn't want to fuss with dinner. All you really need for this is a sheet pan. A roast is a fine choice for Easter, but we opted for a leaner cut with this one. Plus, you don't really need a ton of salt on this. The garlic and herbs take care of the flavor. You've been waiting so long for spring ... we get it. How about a fresh spring linguine? Put a Greek twist on your main course with this crispy, flakey, ooey-gooey casserole. Shrimp Lemon and Pea Cauliflower "Risotto"
All the spring things, this quick-fix dish uses cauliflower rice to mimic risotto. Shrimp, Lemon and Pea Cauliflower "Risotto"
Main DishShrimp, Lemon and Pea Cauliflower "Risotto"
Flakey and flavorful, this sheet pan halibut is just what you were looking for—if easy, healthy, and holiday-worthy is what you're after. Any excuse to grill, right? Even if scallops are on the menu. 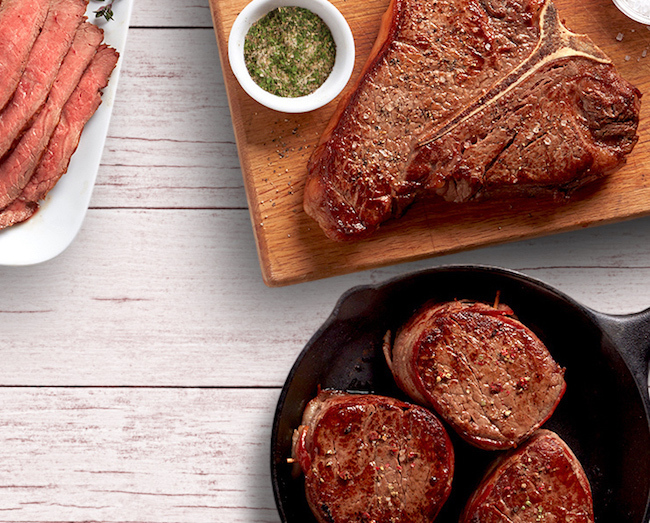 Not crazy about the idea of cooking an individual steak for everyone? Cook two or three larger cuts instead. It's an impressive dish to slice and share.